Present the various options open to the use in terms of construction and servicing water tanks or reservoirs for storing water. Water tanks have been seen in arid regions or in places susceptible to a siege since Antiquity. These water tanks could be for domestic or community use and were very frequently underground or even arranged in natural cavities. Arid land today accounts for over 40% of the land mass and is inhabited by 2.3 billion people, which corresponds to about one third of the world population. The impact of poverty is most strongly felt in the arid regions. 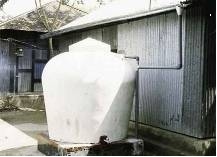 In such a context, water tanks capable of storing a large amount of water (and mainly rainwater) help to fight water shortages and therefore reduce the impact of poverty on the populations. Reservoirs and water tanks can be used in a variety of situations. Firstly, in areas far from water systems but with fairly high rainfall, they can be used to recover rainwater and manage the resource. Nevertheless, reservoirs can be used in all dry regions where available water stocks are essential (to deal with a breakdown in supplies, a potentially contaminated source, etc.). In addition, water tanks can be used in a rural environment where there is normally space to install large storage volumes as well as in town where the large surface area of roofs is an excellent method of recovering water. Smaller or even underground models are necessary in town for obvious reasons of size. Rainwater recovery tanks can prove useful even in areas that do not have a drought problem as they can save on mains water. The water thus recovered can easily be used for lavatories, washing or irrigation which reduces the financial impact of water consumption and therefore reduces poverty. Please refer to sheet E4 Rainwater recovery. Lastly, the water tanks and reservoirs can also be used simply to store the water taken from any type of source (well, river, etc.). Nearby reserves can therefore be built up and the water can be stored in anticipation of the dry season during which the water courses will dry up. 5) What type of reservoir / water tank should be built ? What material should be used ? a) What should be the size of the reservoir ? Small reservoirs are ideal when water is abundant (nearby water course, high rainfall, etc.) as they fill quickly but can also be emptied and cleaned easily. For example, in north-eastern Thailand (rainfall about 1500 mm/year), 2 m3 jars are used which yields about 40 m3 a year and thus covers the annual drinking water requirements for one family. Conversely, large reservoirs are advisable when there is a shortage of water for long periods. This is the case, for example, when there is less rainfall or it is spread over a shorter period. Thus, in the Saloum Islands in Senegal (rainfall 380-800 mm/year), the rainwater is stored up to six months in 15 m3 reservoirs and 30 m3 underground water tanks are found in Ganzu Province in China (rainfall 300-400 mm/year). The following formula can generally be applied to calculate the ideal volume for a reservoir : Reservoir volume = t . n . q + eT where t represents the length of the dry season, n the number of people using the water stored in the reservoir, q the daily consumption per person and eT the loss through evaporation during the dry season. b) What is the ideal reservoir ? Lined reservoirs : no doubt the most rudimentary method available, lined reservoirs involve digging a hole in the ground then covering it with a waterproof liner to store water in it or collect the rainwater. This is the most widespread storage method as it is especially simple and inexpensive to install (about €35 for 6 m3 for example in Uganda) and can satisfy a family’s water requirement for four days. It is nevertheless a very rudimentary system which should be protected, mainly to ensure water quality. hygiene and health. A tap or long-handled ladle should be provided to avoid contaminating the water when removing it from the amphora. N.B. The reader is invited to read sheet .... on storing water for family use for more information on the good practices to be adopted in this scenario. "Pumpkin" jars : this is a variation on the Thai jars used in Sri Lanka. These reservoirs are made of ferro-cement and normally have 5 m3 storage capacity. They cost slightly more - about €145. In climates with high rainfall (about 2000 mm/year) they can supply a minimum of 20 litres of water per day for fifty days, which corresponds to the needs of a family of five approximately. Concrete slab water tanks : this is a relatively simple technique but requires good technical control for optimum construction. In normal rainfall conditions (300 to 800 mm/year), a tank can be filled with 14 m3 and the stored water is far better quality than the other resources available in arid periods (unhealthy surface water or saline water tables). Family involvement in constructing this type of water tank makes people more responsible for their servicing, which is relatively simple - cleaning the inside walls once a year and repainting the outside walls. A 14 m3 tank costs around €200. 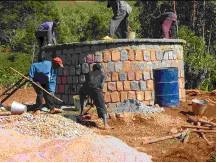 Stone, masonry or wooden water tank : this technique has the advantage of using local materials which tends to reduce manufacturing costs. The technique also has the advantage of keeping the water cool when the outside temperature is high. This is a not insignificant criterion to urge the population to consume the water from the reservoir (assumed healthy) rather than from an unimproved source. This very widespread technique is used especially in Senegal where 10 to 15 m3 reservoirs can stock sufficient water to satisfy the needs of one family in drinking water (3 L per person per day) during the eight months of the dry season. Construction is solid and servicing is very simple and inexpensive. The construction costs are however fairly high - about €900 for the entire system. The reservoir water must not be contaminated by algae, impurities, dead leaves, twigs or dead animals and insects. The reservoir must therefore have a hermetically-sealed, opaque lid fitted with an inspection chamber or manhole for the large reservoirs. Use the doses indicated at the end of the sheet for concrete reservoirs as for any engineered structure of this type. The main advantage of this technique is that reserves can be used during the dry season and the needs of local populations can be provided. In addition, storing water near dwellings helps to alleviate the work of women who are usually in charge of fetching the water from distant sources. The drawback is that the water collected can be or become more or less spoiled and is therefore not fit for consumption if adequate purification or disinfecting measures are not taken. See on this topic Sheet E 17 Simple water treatment methods for use in the home. The costs can vary tremendously depending on the type of reservoir chosen, but a broad price range of €15 to €1,000 can be considered. A wide variety of financing solutions can be envisaged in several cases ; on this topic, please refer to the ARENE IDF document mentioned in 11). The reader is invited to consult the additional sheets E15 Methods for properly transporting and storing drinking water at home, E 17 Simple water treatment methods for use in the home, E 18 Treatment by chlorination and E 4 Rainwater recovery. It is advisable to clean the water tank once a year or once every three years as a minimum. For practical reasons, the access hatch should be made of a robust, but lightweight material (metal, for example) : do not use concrete hatches that are very difficult to raise. A metal ladder must also be provided inside tanks, and possibly a sealed light, for volumes greater than 10 m3 to facilitate servicing. Wait for the dry period in the year to service the tank so that the water level inside it is at its lowest, then empty it and clean the walls with a stiff brush. Numerous examples figure in the very well-documented brochure from Arene Ile de France and PS Eau mentioned at the start of the next chapter and produced following a workshop and seminar involving several NGOs including Caritas. The construction of ferro-cement water reservoirs for drinking water during the dry season in Senegal where the water table water has too much fluorine and chlorides (€900 for 10 m3) is described on pages 109 to 112. Caritas Burundi has built several reservoirs and rainwater recovery systems in the country’s schools. In north-eastern Brazil, CCFD has been involved with 750 local organisations in financing a construction programme for one million rainwater recovery tanks for five million people (€360 per 16 m3 tank built of concrete slabs). - Eutarcie : Internet page dealing with the quality of water stored in the reservoir (mainly rainwater) and explaining the possible reasons for yellowish water, bad smells and how to avoid these problems.